Visual Studio Code>Programming Languages>mrubyNew to Visual Studio Code? Get it now. This extension provides compiler and runtime of mruby (Lightweight implementation of Ruby Language). mruby compiler is included in this extension. You don't need install mruby separately. Automatically re-compile after you changed source code. You don't need to trigger build many times. Report compile errors in VSCode. When compile errors detected, this extension reports errors on source code and in Problems window. Provide executing your Ruby code with mruby in VSCode debug interface. 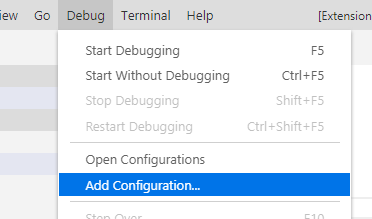 (Experimental) Provide debugging your Ruby code with mruby debugger ( mrdb ) through VSCode debug interface. Open Ruby source (.rb) in VSCode. Press F1 and type Configure Task. Select mruby: Compile with mruby or mruby: Compile with mruby (Watch mode) as you prefer. Select Debug → Add configuration... from menu bar. Select mruby or mruby debugger. Initial release with experimental debugging support.